Overlooking Victoria Harbour, Mandarin Oriental offers elegant rooms with 37-inch flat-screen TV, 10 dining options including Michelin Star restaurant Pierre, a spa and fitness centre. 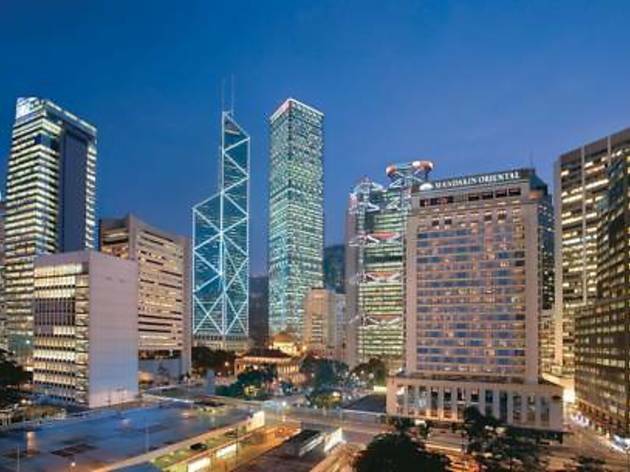 Mandarin Oriental Hong Kong is located in the heart of Central, a major business and shopping district. It is a 40-minute drive to the airport. Spacious and elegant, rooms at Mandarin Oriental Hong Kong feature clear floor-to-ceiling windows with panoramic city and harbour views. Modern comforts like an iPod dock, flat-screen TV and minibar are included. Guests can make use of the steam room, jacuzzi and sauna at the spa. It offers traditional Chinese and Ayurvedic treatments. The fitness centre has an indoor heated swimming pool. Mandarin Grill and Bar serves fresh seafood and western dishes. Cantonese specialties can be sampled at Man Wah. All-day dining is available at Cafe Causette. Mandarin Oriental Hotel also has 2 bars and a cake shop.